I was born in Holzminden/Weser, Germany in 1960. The following year my family and I moved to Perchtoldsdorf, a suburb of Vienna, Austria. After finishing school in 1980 I started studying German and Journalism, and although this was quite interesting, it was not really fulfilling. During the course of 1983, having taught myself, I made my first Classical Guitar. A year later, I attended my first guitar-making course under the tutelage of José Luis Romanillos, learning in those three weeks what most people take three years of apprenticeship to acquire. In the spring of 1988 I completed my second course with José Romanillos in Aalst, Belgium. 1989 was quite an eventful year - I not only received my Master Craftsman’s Certificate in Vienna, but also attended a third course with José Romanillos, this time in Córdoba, Spain. In 1990, in addition to the work in my studio, I contributed to the translation of José Romanillos’ book “Antonio de Torres. 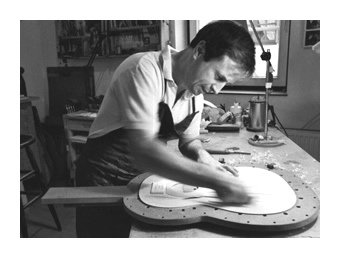 GuitarMaker – His Life and Work” (published by Bochinsky). In 1992 I went to Córdoba for my fourth course with José Romanillos. 1993 was a very important year in my career, which began with a week-long training course at Gibson in Nashville, Tennessee. 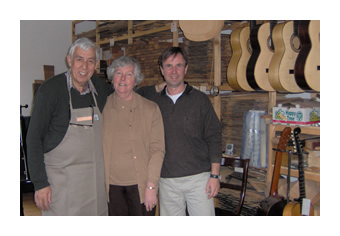 That summer I worked as J. Romanillos’ assistant during his Guitar Makers’ Course in Córdoba. Since the autumn of that year I have regularly worked together with the Japanese Guitar Dealer Eisuke Ozaki (in Tokyo, Kyoto and Osaka). In 1998 I moved to my new house and workshop in Gaaden, situated near Vienna in the Vienna Woods. Since the summer of 2000 I have been working together with the American Guitar Dealer, Miklaucic (Guitar Salon International) in Santa Monica, California. In the autumn of 2000 I also travelled to Japan on a lecture tour (“The Santos Hernández Guitar of Luise Walker”). Since 2001 I have worked as a founder member of “N.I.C.E. – Neufeldner Instrumentenbauer Congress und Erlebnistage“ (“The Neufeld Instrument Makers’ Congress and Event”), an associationfor the continuing education/professional development of makers of musical instruments.